Representative Michael Capuano and Boston City Councilor Ayanna Pressley. 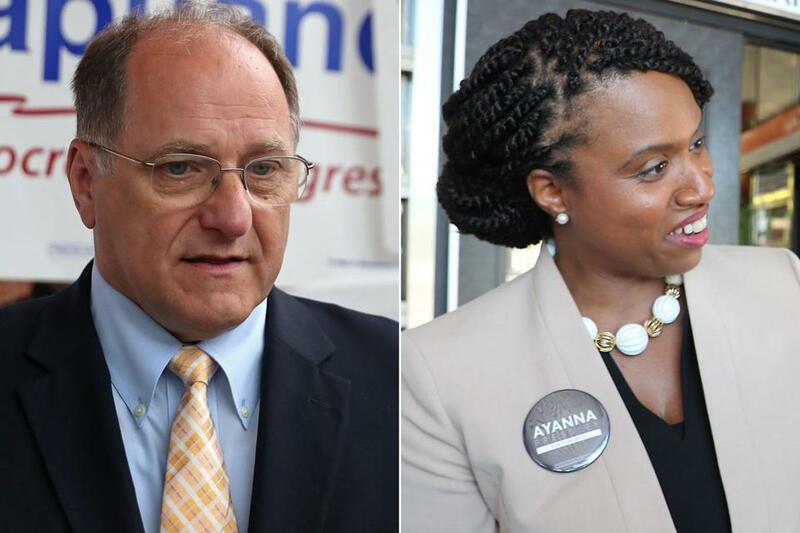 A new survey shows US Representative Michael E. Capuano with a solid lead over his Seventh District Democratic primary challenger, Boston City Councilor Ayanna Pressley, with nearly one month left in arguably the most closely watched primary in the state. A new poll conducted for WBUR by MassINC Polling Group showed Capuano with 48 percent support and Pressley with 35 percent among respondents in the congressional district that includes most of Boston and Cambridge and all of Somerville, Everett, Randolph, and Revere. The Sept. 4 Democratic primary pits Capuano, a 10-term incumbent, against Pressley, the first black woman elected to the City Council. Overall, the poll showed both candidates were liked, but Capuano, 66, is better known. Fifty percent of respondents said they had a favorable impression of Pressley, while 65 percent reported a favorable impression of Capuano. Nine percent said they had never heard of Capuano, while 26 percent said they had never heard of Pressley. The last time MassInc Polling Group surveyed the race for WBUR was in February, shortly after Pressley announced her bid, and Capuano had a 12-point lead. While the numbers may serve as a boost to Capuano’s campaign, primaries are often low-turnout races with surprising outcomes. In the case of Pressley, the poll shows her path to victory: driving turnout among younger voters, particularly those of color. Pressley, 44, is ahead of Capuano by 8 points among voters aged 18 to 49 in the survey. Her lead among nonwhite voters is even larger, 49 to 31 percent. The Seventh District is the only majority-minority congressional district in New England by population. But the majority of voters in the district are white. The poll surveyed 403 likely voters in live telephone interviews on cellphones and landlines from July 27 to 29. The margin of error is 4.9 percent. Capuano and Pressley are both scheduled to attend a debate Tuesday sponsored by The Boston Globe, WBUR, and the McCormack Graduate School of Policy and Global Studies at UMass Boston.